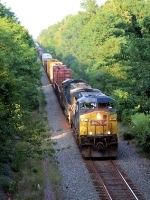 Description: Eastbound CSX manifest train at East Aiken, Maryland on December 24, 2007 at 8:24 a.m. I've seen photographic evidence that the damage to the plow on the engineer's side of the locomotive occurred at least three years ago, yet CSX has never fixed it! Description: is coming east with her usual few cars and the Herzog hoppers that went east through charlottesville last night. She will load up the Herzog cars at verdon on g west tommorow. Description: What I am guessing is Q434 caught me by suprise at Iona Island while a thunderstorm was battering the area south of me. Description: North Greenwood Ave., 1807 hours. Description: CSX SD70MAC 4585 trails on W070 South. Description: CSX Q123-26 heads through the signal bridge at CP 37, and past the new city water tower. Description: Freight manifest train Q368 going east on a restart, early in the morning in Broadford, Pa. Description: Freight manifest train Q368 heads east through the snowy CSX yard in Connellsville. The tower on the left has not been used for decades. Description: E492 comes under the signal bridge at Upper Sandusky.